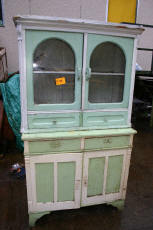 Yet more dressers to look through - hope you are not bored yet. It is quite fun looking at the before and after photos to see what an amazing transformation takes place. Again, this could be a tall dresser, or a glazed bookcase. I have posted it here as I think it would work really well in a kitchen. This piece has now been stripped and restored and re-painted in cream and sage, as soon as it has been glazed I will post the new after photo. Well its a pretty amazing looking piece now. We hung on for ages before we restored this dresser because we thought it was a hard wood and not pine, so it was a nice surprise to find something this nice underneath all that brown paint. This dresser is actually all one piece at the moment - I think that might change when we strip and restore it, but a good sized dresser none the less. 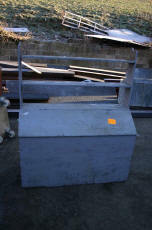 I wasn't sure if I should put this on the dressers page, but I guess that's the best description of what it is, its a bran bin with a rack built in. The sloping lid lifts up to reveal three storage compartments. Could be used for laundry, pet foods, or shoes and boots by the door. 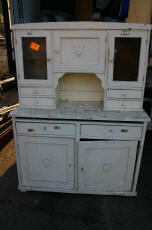 This is a nice size dresser, I think it will look a bit better proportioned with a bit of a cornice around the top. Nice lower doors too. This is a good looking piece. Sometimes with this style - where there is no work space on the surface, we advise people to hang the top part on the wall above the bottom. 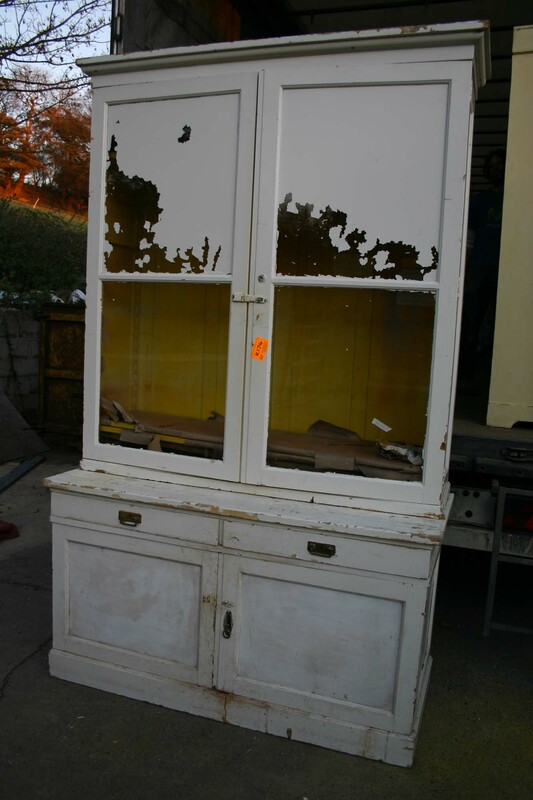 This is a good clean dresser, well proportioned, it has a higher top, this will look great once it has all been stripped and finished. This poor old dresser needs a lot of attention, but once restored it will look really great. Its nice that the effect on the doors is repeated on the bottom as well as the top. So it ended up as half a dresser really, but so good looking. 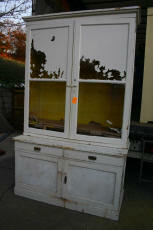 This dresser is a bit different with the two nice wide doors at the bottom and the three little doors on the top. We have got the missing drawer for this dresser so please do not panic. This is really unusual with the gallery top and the small drawers. I know what you are thinking..but it will be beautiful one day I assure you - first impressions don't always count. How about this for a large early English dresser. This photo does not really do it justice. It is a stunning piece, the thickness of the top of the base is tremendous. It has gun-barrel turnings and rounded ends. It just doesn't get any better. 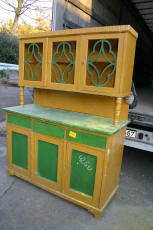 I don't think the colours are doing this large dresser many favours right now. It is a really, good substantial piece, but I don't think green and mustard can ever be good. Wow - this really did turn into the beautiful swan didn't it - stunning.